Legend has it that when the first Zara store opened in Britain, on Regent Street in London, shoppers were a little mystified. The prices seemed high, and I’m told (perhaps apocryphally) that if consumers said they would come back when there was a sale, the assistants would tell them that come sale time the pieces would not be there. In fact, even if the tentative shoppers were to come back next week the pieces wouldn’t be there. That was not the Zara way. The Zara way—the one that broke all previous rules—had several defining characteristics, but No. 1 (and sacrosanct) was that the Spanish retailer manufactured only relatively tiny quantities of each style. This sounds like a small deal, but effectively it turned fashion retail on its head. Instead of focusing on quantity, Zara’s cadre of around 200 designers in Spain come up with around 40,000 new designs each year, of which 12,000 are actually produced (that’s 4,000 more than Topshop). Zara’s cadre of around 200 designers in Spain come up with around 40,000 new designs each year, of which 12,000 are actually produced. Years ago, when I worked in a shop, we were forever phoning up customers when new deliveries came in. Not any longer, because in Big Fashion, stock replenishments are for wimps. This creates a terrible hunger in the consumer, creating what Harvard researchers have referred to as a “sense of tantalizing exclusivity,” a pervasive fear that if you pause for thought, the opportunity to bag that affordable version of a catwalk sensation will be snatched from you forever. 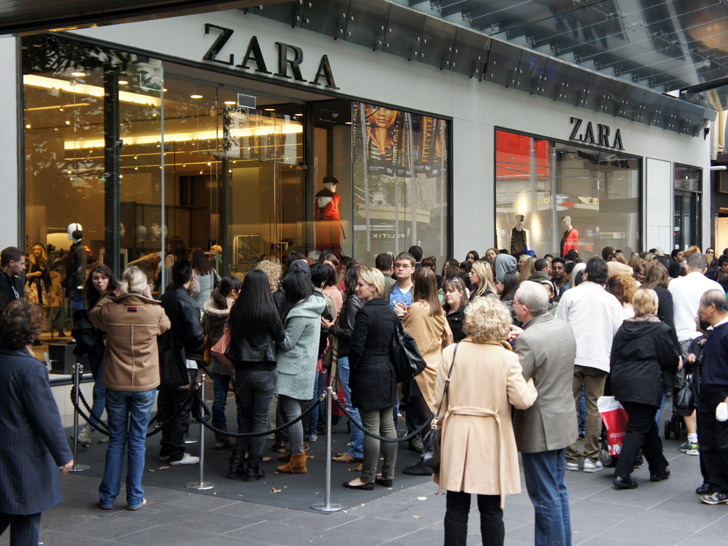 Whereas a typical retailer could expect its customers to visit four times a year, Zara could bank on an average of 17 visits. “This business is all about reducing response time. In fashion, stock is like food. It goes bad quick,” said Inditex chairman José Maria Castellano, whom many credit with coming up with the Zara blueprint for blink-and-you-miss-it-fashion. Zara had no truck with discounting 35 to 40 percent of its merchandise (the normal figure for fashion retailers) because it had ordered skinny jeans in the wrong wash or a jacket with last week’s lapel size. Instead, it set up a system that means it only ever discounts around 18 percent of its products, according to analysts. Rather than trudging along taking nine to 12 months to decide on a style using forecasters and analysts, then take a risk on ordering and choosing colors and fabrics, Zara set up a relatively large production team at Inditex’s Spanish HQ on the distinctly non-fashionable Arteixo-La Coruna, and relied on them to liase with trend-spotters on the ground, constantly emailing and phoning in with suggestions to get a highly reactive consumer-led view of what’s hot and what’s not. If the hipsters suddenly develop a thing for vampires, or swing away from brogues and Victoriana, the Inditex office will know about it. What was definitely out of fashion was holding onto lots of stock, or indeed any stock. The result was that 163 Zara stores across Europe (60 in the U.K.) received new fashion pieces twice a week. Other pretenders to the high-street throne goes the message. Esprit and Mango tried the same approach: short lead times and multiple seasons, along with reduced delivery times—these could be as little as 48 hours. What was definitely out of fashion was holding onto lots of stock, or indeed any stock. As consumers we rapidly changed our priorities. Long-standing skills of buying clothing, such as assessing for quality or looking at labels, were junked in favor of getting our hands on what was new as we adjust to the Zara-like thrill of swapping two wardrobe seasons a year (and the delayed gratification of waiting to embrace those two seasons) for upwards of 20. While the world’s mainline Fashion Weeks continue the charade of Spring/Summer and Autumn/Winter seasons, in real terms they are now about as relevant to contemporary life as the Gregorian plainsong. Extracted with permission from To Die For: Is Fashion Wearing Out the World (£12.99) by Lucy Siegle, published by Fourth Estate, an imprint of HarperCollins Publishers. Legend has it that when the first Zara store opened in Britain, on Regent Street in London, shoppers were a little mystified. The prices seemed high, and I'm told (perhaps apocryphally) that if consumers said they would come back when there was a sale, the assistants would tell them that come sale time the pieces would not be there. In fact, even if the tentative shoppers were to come back next week the pieces wouldn't be there. That was not the Zara way.